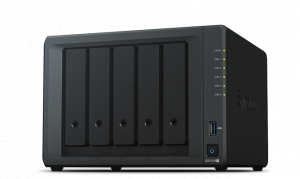 Synology DiskStation is an 8-bay NAS designed for small and medium-sized businesses, providing oustanding performance with great expandability. With various built-in applications and comprehensive data protection technologies, DS1819+ fufills different business needs while safeguarding users valuable digital assets. DS1819+ is backed up by... more Synology's 3-year limited warranty. Synology EW201 , 2 years extended warranty for DS1517+ , DS1817+ ,DS1517,DS1817 , DX517, NVR1218,VS960HD,DS1618+ only. MUST BE SOLD WITH NAS AT THE SAME TIME. Synology EW201 , 2 years extended warranty for DS1517+ , DS1817+ , DS1517, DS1817 , DX517, NVR1218,VS960H0,DS1618+ only.MUST BE SOLD WITH NAS AT THE SAME TIME.Extend your devices from 3 years warranty to 5 years.